Puzzles are a great way to improve your brain function. To solve them, you need to concentrate and think hard, and that helps your brain stay sharp. It’s also scientifically proven that people who solve puzzles on a regular basis have lesser chances to suffer from memory loss and dementia. So, here’s a simple puzzle for you. 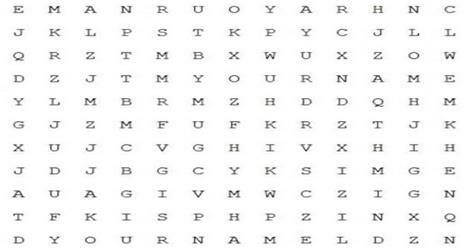 Your name is somewhere in this picture. Can’t find it? Don’t worry, you’re not alone, the majority of people said they can’t find it either. Do you want to hear the solution? Don’t scroll all the way down until you’re completely sure you want to give up. Well, most people try to find their name, spending a lot of time staring at the screen, searching for it and eventually getting frustrated, but the answer is really simple. You weren’t instructed to find your name but to look for the phrase “YOUR NAME” instead. Why don’t you look at the picture again now and see how easy this puzzle really is. It’s meant to stimulate your brain to think a bit out of the box and involve their brain in something other than watching a movie or refreshing their Facebook newsfeed.